Have you ever needed to be "buzzed in" to a building or room by someone on the other side? If so, you've seen an electric strike type of lock. Many New York locks are like this. The door is locked because of an electric current that keeps the latch of the lock in place, and the latch will not move until the current is broken. This may mean a key or it may mean a signal from an outside source, such as when someone else buzzes you in. There are many advantages to electronic door locks like this. Being able to control it from a remote location is one such obvious advantage. You are more secure since you can check potential visitors without having to get up and open the door, and it's more convenient to do so as well. You can typically open the door from the exterior without having to unlock it when you use an electric strike lock, making it even more convenient for offices and other businesses. a person can more readily jimmy the door open or pick the lock by working the tumblers. With electronic door locks, the electrical current is present and active and cannot be picked with a paper clip or pin. The locking mechanism is also larger and more secure so you have a difficult time just kicking it in. This means everyone on the other side of the door is more secure overall. 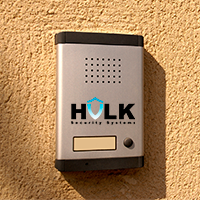 For the best New York locks, go with Hulk Security Systems.